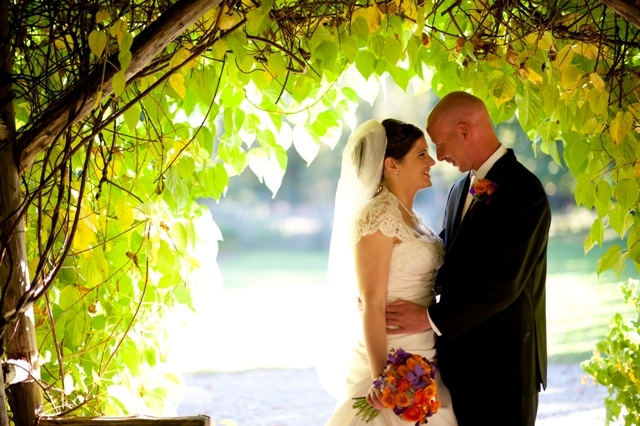 Jamie and Jillian, Just Married at Locust Grove! I love a good love story. When I saw the slide show of this event it completely took my breath away. This wedding was beautiful. I loved working with Jillian. She is one of the most hysterically funny, and quick witted people I have known. Her e-mails always made my day, and made me laugh out loud in the middle of the night as I read them. 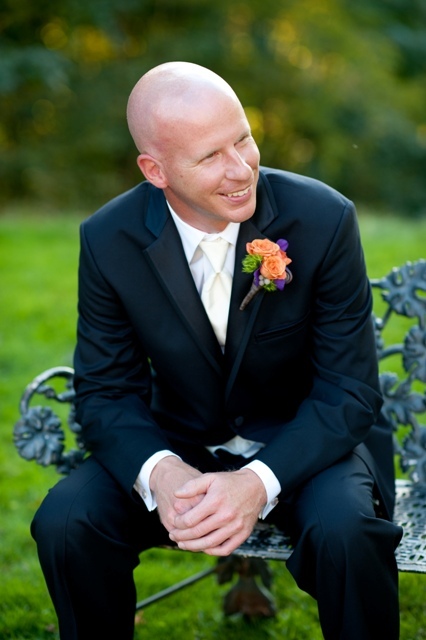 “The “vibe” I was going for on my wedding day was “macaroni and cheese meets champagne.” We actually ended up forgetting to buy champagne and toasting with some ginger ale and sparkling cider concoction, but that’s neither here nor there. The point is, I wanted my wedding to be both elegant and comfy-cozy. 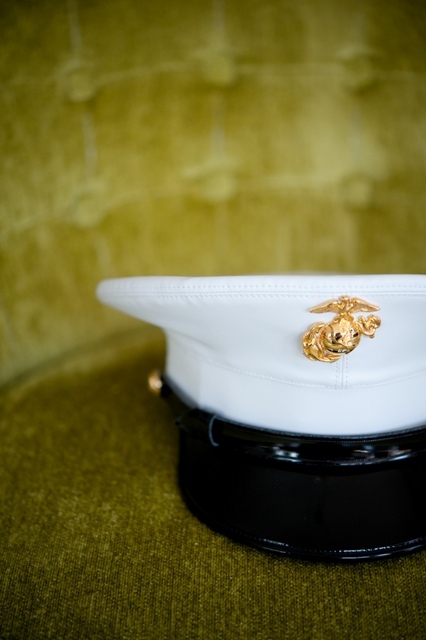 My fiance and I had been living 600 miles apart for 2 years while I was in grad school, and 6000 miles apart for 6 months while he was deployed overseas, so our wedding was all about coming home to each other (hence, the comfy-cozy feel). 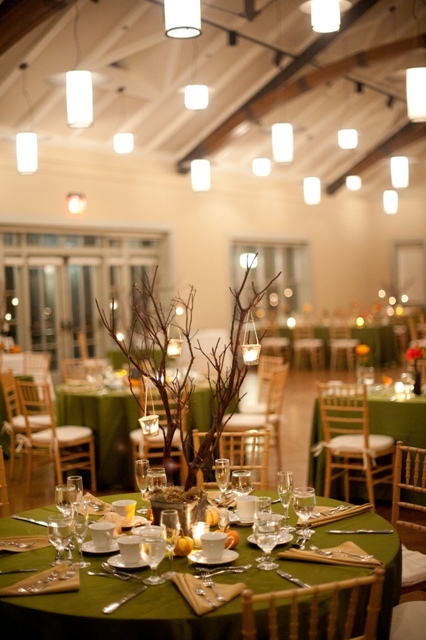 We chose Locust Grove as our venue because the grounds were beautiful and the reception room was a blank slate. This was all inspired by a collection of vintage bottles that my sister, my father, and I spent many childhood afternoons digging out of the ground in the Bronx and Westchester. Some were chipped, some were crusty, but they were all awesome and I was determined to use them as my wedding center pieces. 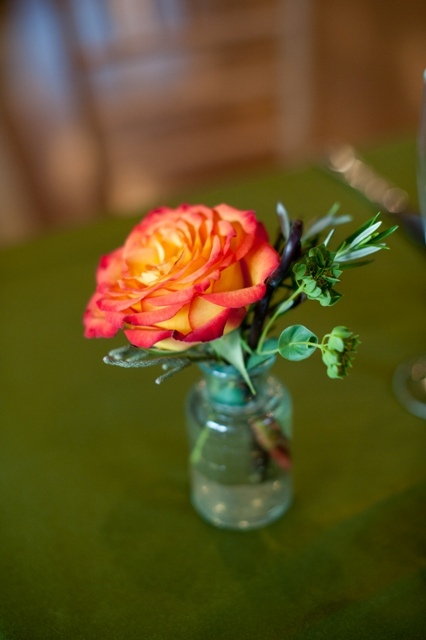 Heather made this happen in the classiest of ways by lining the bottles up on rectangular tables and filling them with an explosion of orange flowers, including dahlias and the most tremendous roses I have ever seen! We didn’t have enough bottles for all of the tables, and I wanted to add some drama to the room, so my mother found some amazing manzanita branches on recycled bride and set to work. She created gorgeous centerpieces by placing the branches in rustic tin buckets, covering the base with moss, and dangling mercury glass hanging votives from them. 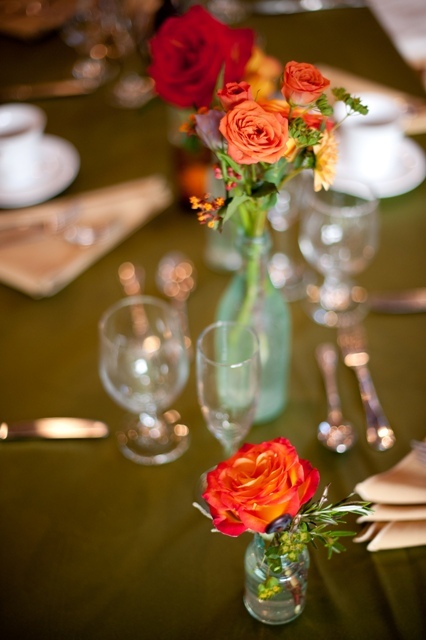 These beauties were placed on round tables with some pumpkins and gourds for some fall pizzazz and color. The whole room popped with satiny green (yes, green!) linens that Heather and I painstakingly picked out! 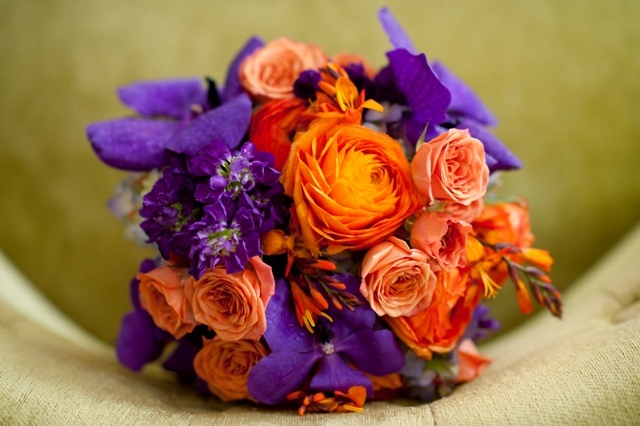 For her personal flowers, Jillian really wanted Orange and purple to be the main colors in her bouquet. I have been wanting to work with Vanda Orchids for sometime now, and I was so excited to be able to use them in this bouquet! Their color is just amazing! 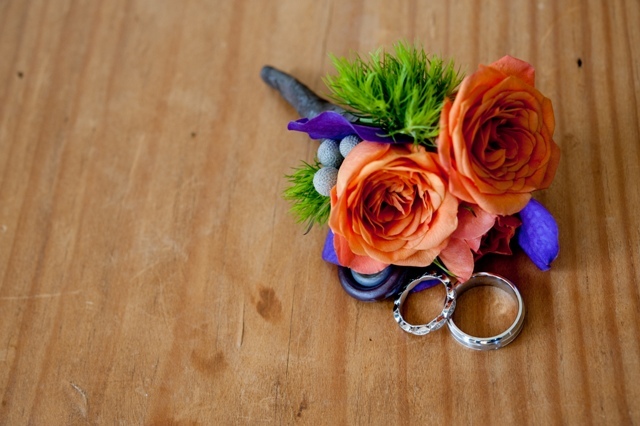 Jillian’s bouquet consisted of Ranuculas, Spray Roses, Double Stock Flower, Crocosmia, and a few others. 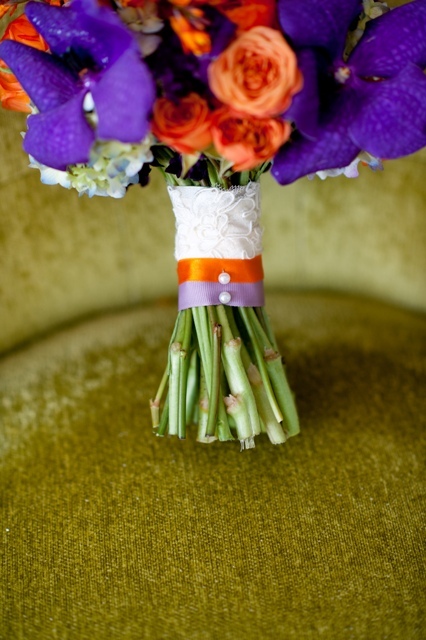 Her bouquet handle was wrapped in the same lace from her dress, and accented with purple and orange ribbon. 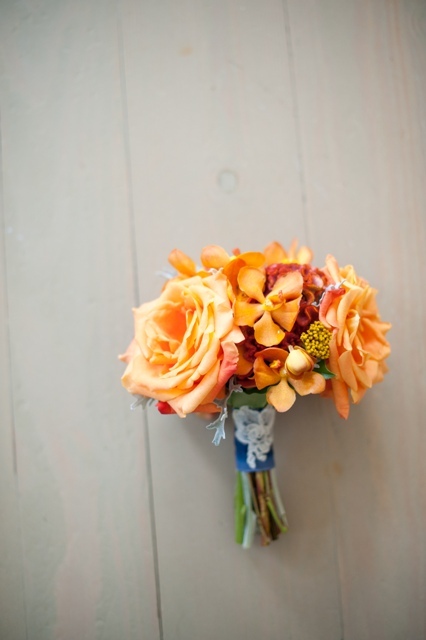 This is a photo of Jillian’s Mother’s posey bouquet, which was a nice modern option instead of a traditional corsage. 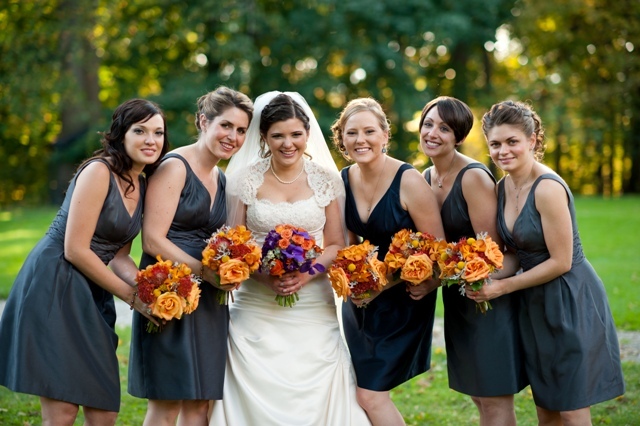 The bridal party carried bouquets containing Orange Mokura Orchids, giant orange Roses, Pin Cushion Proteas, velvety Coxcomb, Dusty Miller, and Craspedia. They looked so beautiful against the pewter dresses. I really wanted them to almost be reminiscent of a fuzzy, textural kind of sweater that you would find at Anthropologie or Urban Outfitters (hopefully you all know what I am talking about). 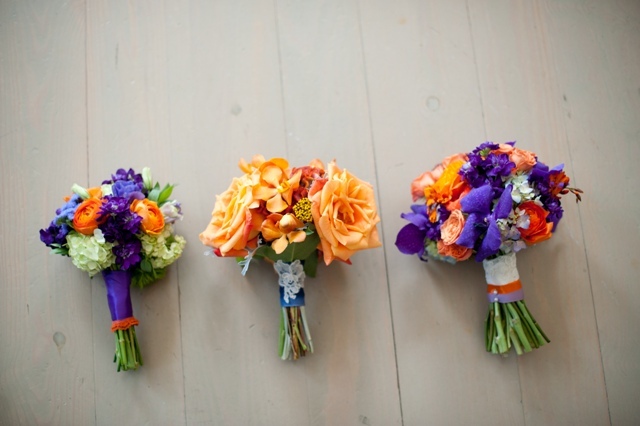 They were wrapped in pewter double faced satin and edged with very thin orange lace trim. 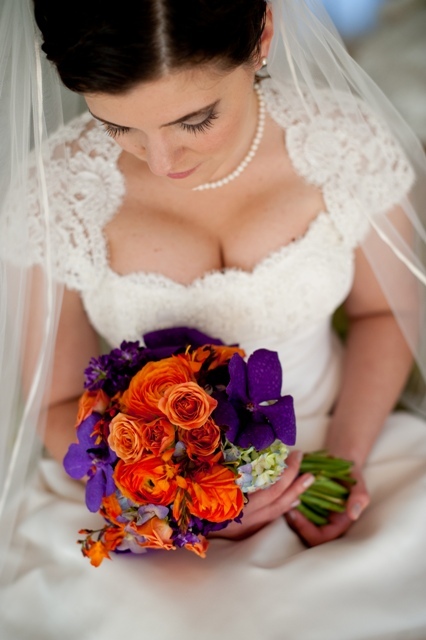 The Maid of Honor’s bouquet had the same lace trim from Jillian’s dress on it. 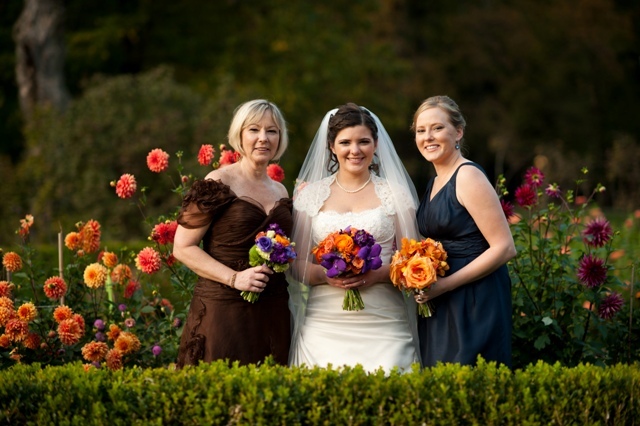 This photo shows the Mother of the Bride’s Posey Bouquet, The Maid of Honor’s Bouquet, and the Bridal Bouquet. Here are the bottles which became the “macaroni and cheese” part of the day. 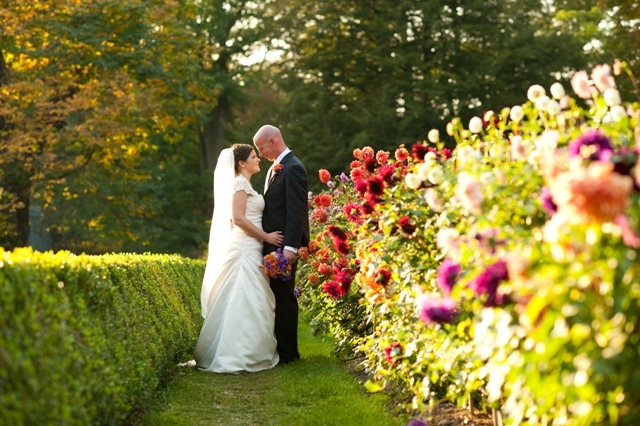 The “champagne” was added into the decor by pumping up the color with the large bloomy, fully blown open roses and Dahlias. 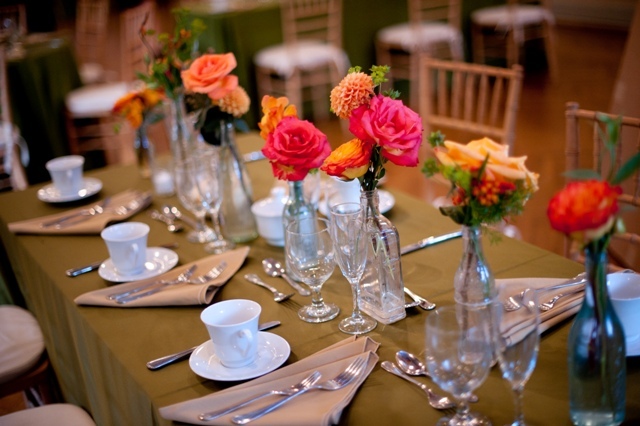 We added even more formality by providing our own custom rental linens to the tables. 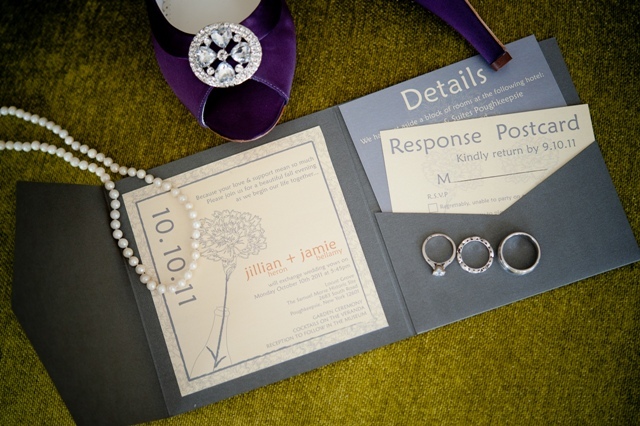 Jillian selected the most perfect olive green satin you could imagine, with soft wheat toned napkins. 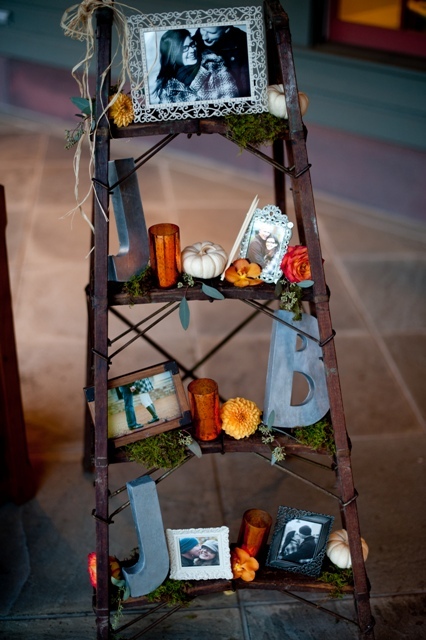 This looked amazing with the wood toned chairs, and wall colors at Locust Grove. Despite all of these very different elements, I think we did a very good job of making everything look cohesive and put together. Congratulations Jamie and Jillian!!! I miss you guys already(sniff)! It was an absolutely glorious day!!! Who needs David Tutera!! LOL! Everything did come together so beautifully!! 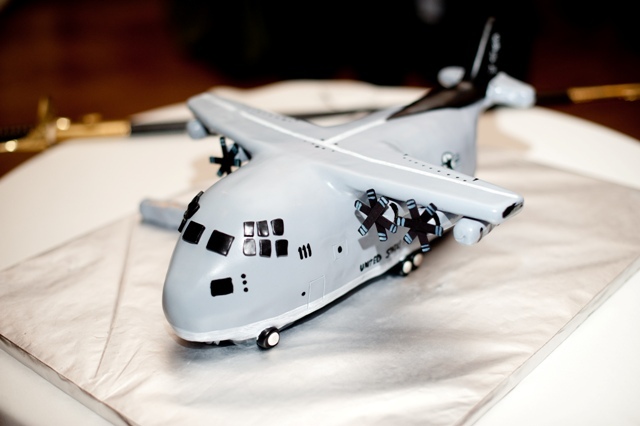 A lot of time & hard work well spent! .I had post wedding blues for a week! Great post! Their wedding was beautiful and very well put together. 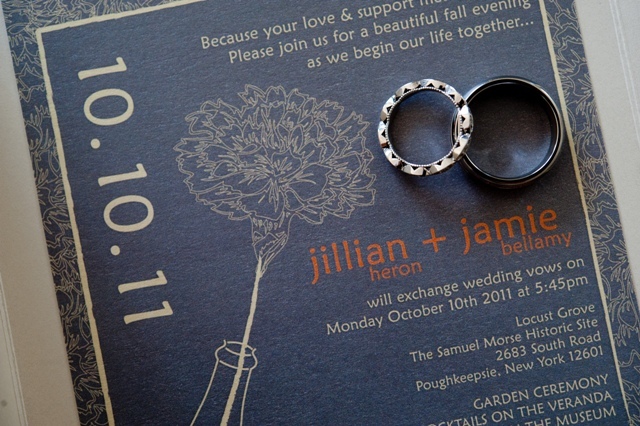 lots of attention to details and more than anything Jillian and Jamie were so in love and enjoyed their day! Each picture is more beautiful and breathtaking than the last. Honestly these pictures take me to another dimension, a romantic place that I wouldn’t mind living in for good. How wonderful to have wedding day memories in the for of artful photographs, which depict each and every detail so beautifully. I have seen many weddings in my lifetime, but none as perfect as Jim and Jamie’s wonderful wedding day. 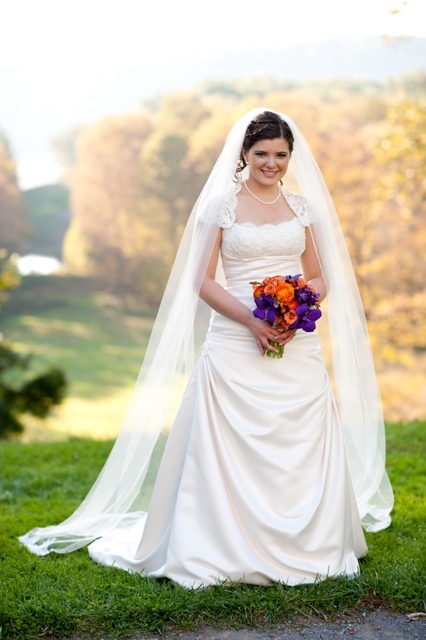 The wedding photos are just gorgeous. 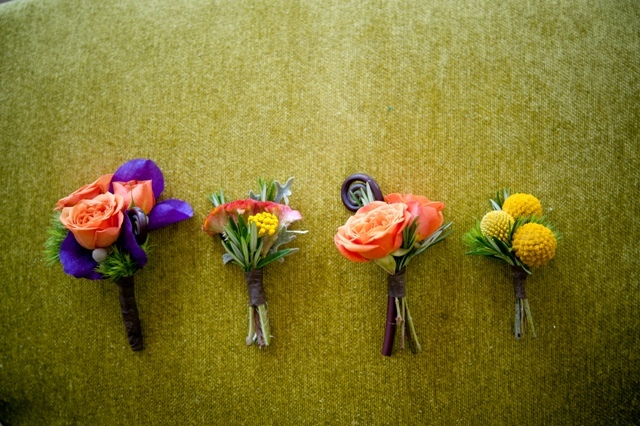 The combinations of flowers were just stunning. 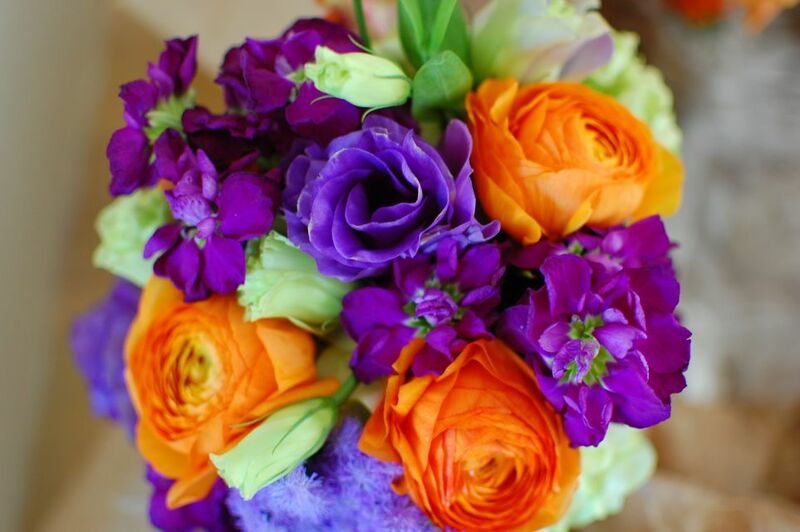 The orange and purple were just so unique. 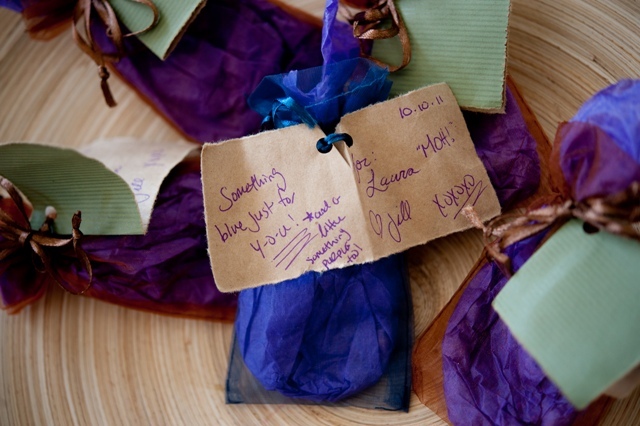 The color of the bridesmaids dresses was so different as well. Everything was so beautifully put together. The bride and groom were glowing!